The Sea Horse, Lord Melville and Boadicea transports were shipwrecked on the south coast of Ireland, almost two hundred years ago, on 30 and 31 January 1816. Taken in tandem, the wrecks represent one of the greatest maritime disasters to have been recorded in Irish waters, perhaps surpassing even the horror of the wreck of L’Impatiente, a frigate from a French invasion fleet that foundered off Mizen Head on 29 December 1796, with the loss of 552 lives. Ramsgate on the morning of the 25 January, would have presented a bustling scene as the troops of the 59th and 62nd regiments, marched down the Military Road to the harbour to embark on their vessels for their journey to Cork. The majority of the 59th boarded the Sea Horse, Master James Gibbs, a ship registered in Lloyds as having a burthen of 295 tons, with a crew of 17. She reportedly took on board five companies of the 59th regiment, consisting of 16 officers and 287 men, 33 women and 38 children and a young naval officer, travelling to meet his ship the Tonnant, a total of 393 persons. The remainder of the regiment embarked on the Lord Melville, Master Thomas Arman, a ship with a burden of 351 tons. She reportedly, took on board 3 captains, 8 Lieutenants, 3 ensigns, 260 rank and file, 2 servants, 33 women and 30 children, a total of 339 of the 59th Regiment and part of the 62nd Regiment, consisting of a Colonel, 1 Captain, 2 Lieutenants, 3 Ensigns, 75 rank and file, 1 servant, 6 women and 2 children, a total of 50. 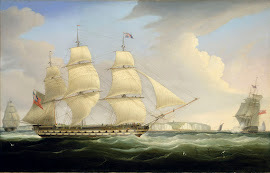 The William Pitt, Master G Proctor, the largest vessel of the three, with a burden of 418 tons, took on 18 officers and 406 men of the 62nd Regiment, the remainder of that regiment, 6 officers and 80 men, embarking on the Hound, Master Chapman, a three year old ship, with of 324 ton burden and an A1 classification. Ramsgate Jan. 25. - Sailed the William Pitt, Lord Melville and Sea Horse transports, having on board the 2d battalions of the 59th and 62d regiments for Ireland; they are the finest transports we have had in this harbour for a length of time past. The Duncombe and Hound transports are still here, waiting the arrival of either the 14th or 44th regiments, also destined for Ireland. The above regiments were intended to have been embarked at Dover, but the transports taking them on board were considered to draw too much water for that port. 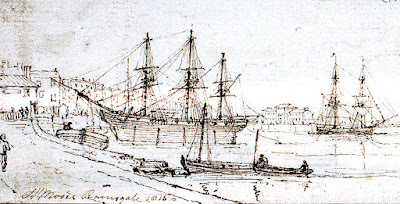 Sailed the Good Statesman transport for Plymouth; Catherine transport for Ostend; and Exchange transport for Calais, with several freight vessels, to bring over the Blues and 3d Dragoon Guards; 5 or 6 transports remain, taking in the heavy baggage of different regiments, for hull, London and Portsmouth. Upwards of 100 sail of merchant vessels of different descriptions have got to the sea this tide, bound to the Westward. Having sailed on 25 January, the three transports came to anchor in the Downs, an area of sea, near the English Channel off the East Kent coast, awaiting the right wind for the voyage. Here they were joined by the Boadicea, Fox, Promise and Fancy, Martin, Mariner 2nd, Promise, Betsy, Lord Cawdor, Patriot, Elizabeth, Mariner 3rd, Triton and William troop transports that sailed from Dover on the 26 January bound for Ireland, according to Naval Intelligence. The Boadicea and Fox were transporting the 82nd regiment to Cork, while the other ships were transporting the 16th and 35th regiments and the 2nd Garrison Battalion. The Harmony, John and Eleanor transports also sailed to Plymouth: the Britannia for Ostend and the Ulysses and Britannia transports with troops to Calais. Taken in tandem, with the transports, voyaging from Portsmouth and Plymouth, an estimate of 10,000 troops under sail, bound for Ireland, would be on the conservative side. The ships parted company as they made their way through the channel. James Gibbs, master of the Sea Horse and Thomas Arman, master of the Lord Melville, both left correspondence describing their voyage. According to Gibbs, about 11am on the morning of 26 January, the Sea Horse weighed anchor, and sailed with light breezes from the N. N. W. and by about midnight was off Dungeness, a headland further along the coast of Kent on which a 115 ft. high lighthouse was built in 1792 by Samuel Wyatt. At about midnight, they spotted the Portland Lights to the N. E.
On Sunday, 28 January they passed Start Point, with the breeze coming from the N.N.E. They then altered course in the afternoon as they passed Lizard Point at 5 o’clock and at 11 o’clock they passed the Longships Lighthouse, Lands’ End, 1 ½ nautical miles off. At midnight, it bore N.N.E., 8 miles away. From here they sailed into the Irish Sea and set a course for Cork. On the morning of 29 January, there was a fine strong breeze coming from the S.S.E., a favourable wind direction in which to sail to Cork. But at noon this was getting much stronger. As Gibbs’s account states, the Sea Horse made landfall at Ballycotton Island at 4pm with the rising wind still coming from the S.S.E. From this time onwards, it was to be ‘a constant and awful struggle with the conflicting elements’. The mate, John Sullivan, a Cork man, well acquainted with the coast, then went up the forerigging to look at the land, but fell down on the forecastle, and broke both his legs and arms, and unable to speak, died in the arms of his wife, almost three hours later. (It has been stated that he may have been the only one on board that was well acquainted with the coast. However, this is highly unlikely, as transport vessels regularly shipped troops to and from Ireland via Cork and Waterford, the Sea Horse herself having been surveyed in Cork in 1813.) Gibbs then altered his course, as the gale grew, making westward for Kinsale Light House, intending to alter course and run along the land to the entrance to Cork Harbour once it was sighted. However not having not seen the light after sailing for two hours, doubts set in and he became unwilling to proceed any further, as the weather was so thick and hazy. With the most tremendous sea running, he decided to take in the top sails and hauled close to the wind, heading in a W.S.W. direction out to sea. According to Thomas Redding, a seaman on board, ‘In consequence of the affecting loss of his chief mate, Captain Gibbs was very greatly annoyed during the night, and appeared to have lost much of that self-command so essentially necessary to the safety of the vessel, passengers, and crew’. At 8pm, the ship got blown off course and spent most of the night on another heading of S.E., the wind coming from the S.S.W. which was now on their starboard bow. The tide was setting towards the land and with a large swell they were being pushed N.E. towards the lee shore, an unadvisable course of action. According to Redding, he spotted a ‘fogbank or the land’ at about 4 o’clock in the morning and reported it to the second mate, Wilson, who first derided the idea, but then called the Captain, ‘who had been sitting for some hours on the companion, apparently lost in a reverie’. They then laughed at his report. They were still drifting in an easterly direction when at five in the morning, 30 January, they sighted Minehead which was inside them to leeward, wind still coming from the S.S.W., they then let a reef out of the topsails and set the mainsail-blowing very hard in order to help get away from the land, but the wind was so strong that about 10.30am, it broke the fore topmast and it went over the side. A seaman who was in the foretop had his back and thigh broken. They were still being blown in the direction of Waterford, when, about an hour later, just after the wreck of the fore topmast was cleared, the mainsail then split to ribbons. By this time, Gibbs had realised his mistake, and was desperate to get out at sea, away from the lee shore, but this was not possible with the damage to the masts and the ship not responding to the steering helm. The raging sea was sending them to the shore so fast, that even though they spotted the Hook Light House under the lee bow, they could not weather Brownstown Head. They took in all sail and anchored under the head in seven fathoms of water, using both anchors, they let out 300 fathoms of cable to try and hold the vessel. The cables were leading straight out in front of her, turning her bow to the sea, and her stern towards the shore, as the waves continued breaking over them. At about 12am, the anchors dragged, as the sea bottom was probably just sand. The wind and sea were still increasing, with huge waves crashing over the ship from stem to stern (from the front to the back of the ship). At 12.10pm her stern struck. They then cut away the mizzen and main masts; all the boats connected to the masts were now washed away. As the ship struck a second time, the rudder, which was, by now of little use, broke off and the sternpost was knocked in. Redding stated that about fifty soldiers had rushed into the quarter-boats, to try and save themselves. However, the boats were rigged to the mizzenmast which was being cut down and were about to go overboard. They were ordered to leave the boats, but refused to obey orders and were dashed into the sea and drowned. The sea continued to break immensely over the ship and about an hour later, she split in two by the main hatchway. All the people on board were clinging to different parts of the wreck. According to Gibbs, there was not the least disturbance among the women. Mrs Baird was trying to comfort her two daughters in the great cabin, while a Serjeant’s wife huddled between decks with her three children. The other women were heard pleading with their husbands to die with them, most of them uttering prayers. However, Redding paints a more realistic scene, with women screaming for their husbands and personal preservation coming to the foremost of almost everyone’s minds. After the ship broke in two, all but about 30 people that were left clinging to the forerigging were washed off. According to Gibbs, about 60 people reached the shore, but for the want of assistance only 4 officers, 25 soldiers, two of whom are died shortly afterwards, and two seamen and himself were saved. Mr Hunt, of Tramore, and his man, Mr. Duckett, jun. and two countrymen, one named Kirwan, were the persons who contributed most to save the lives of the unfortunate people. To the indefatigable exertions of Mr. Hunt, in getting us up to the cottage at the Rabbit-burrow, and sending for spirits to his own house, and lighting large fires for our accommodation, we are principally indebted for our lives. In 1816 Ramsgate was a busy port, 1496 vessels were registered as having entered the harbour in the previous year. Ramsey’s Waterford Chronicle, 1 February 1816. Cork Advertiser, 1 February 1816. 62nd Foot 1815 & 1816 War Office Regimental Pay Lists, National Archives WO 12. Cork Mercantile Chronicle, 31 January 1816. Waterford Mirror, 5 February 1816. Waterford Chronicle, 6 February 1816. James Acland, Enemy of Corporate Despots, Memoirs and Correspodences of a Ghost, Redding’s Reminiscences. No 1, copy online at https://enemyofcorporatedespots.wordpress.com/. Charts of the bay record the depth of water directly inside Brownstown Head as 42 ft. or 7 fathoms. Much of this chapter is based on Walter Phelan, Master SDPO’s interpretation of James Gibbs’s narrative. All errors are the author’s own. Hi Raymond, Good to hear from you. Your welcome to use any of the information that I have posted in your slide show. I'll see if I can find a few more images for you. I saw the cover of your book, with the image of the bones of the men of the 82nd Regiment, being removed to Oldcourt on carts. Do you have any details of when you located the plaque? Ramsey’s Waterford Chronicle Thursday 1 February and Saturday 3 February 1816. 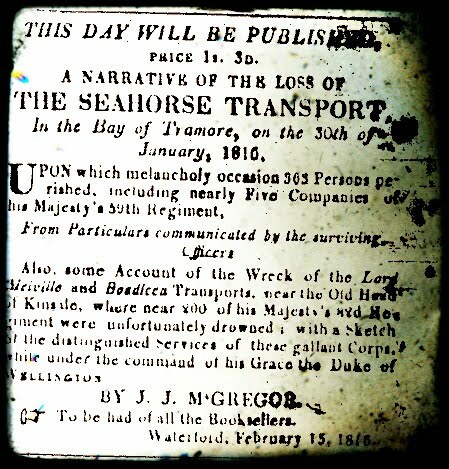 John James McGregor's pamphlet on the wreck of the Sea Horse was first published on 15 February 1816. Click on the picture for a full transcription. Click on the picture for an article on the monuments. 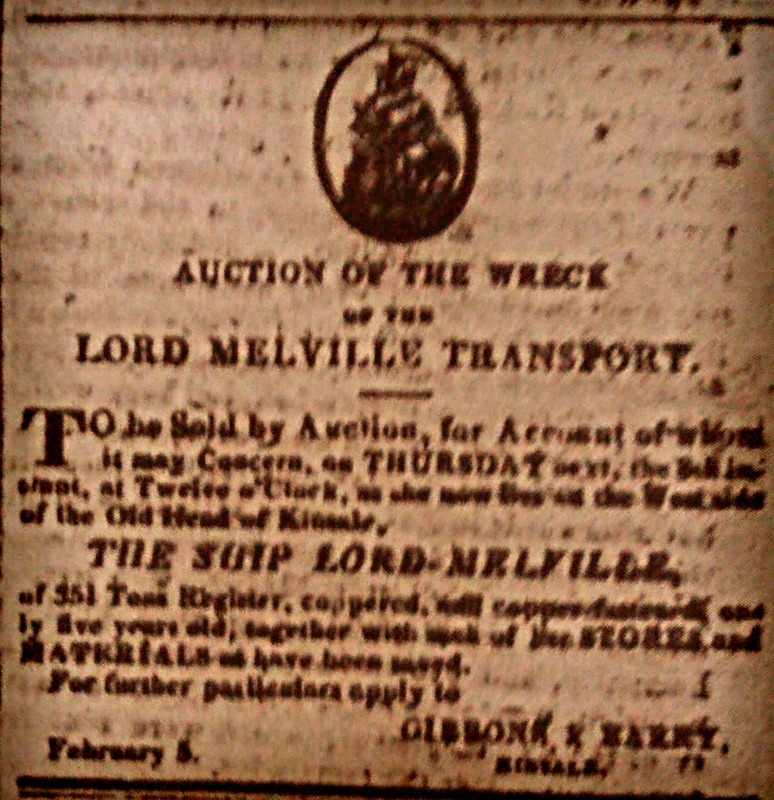 To be sold by Auction For account of who it may concern, on Thursday next, the 8th instant, at twelve o’clock, as she now lies on the west side of the Old Head of Kinsale, The ship Lord Melville, of 351 tons Register, coppered and copper-fastened only five years old, together with such of the stores and materials as have been saved. For further particulars apply to Gibbons & Harry. February 5th, Kinsale. Click on the picture for details of the correspondences of Thomas Arman, Master of the Lord Melville. A portrait of the Atlas, off South Foreland, near Dover, by William John Huggins, 1822. On 14 February 1817 the remaining officers and men of the 2nd battalion embarked on the Atlas, a ship in the East India Company’s service, captained by C O Mayne, bound for Bengal. 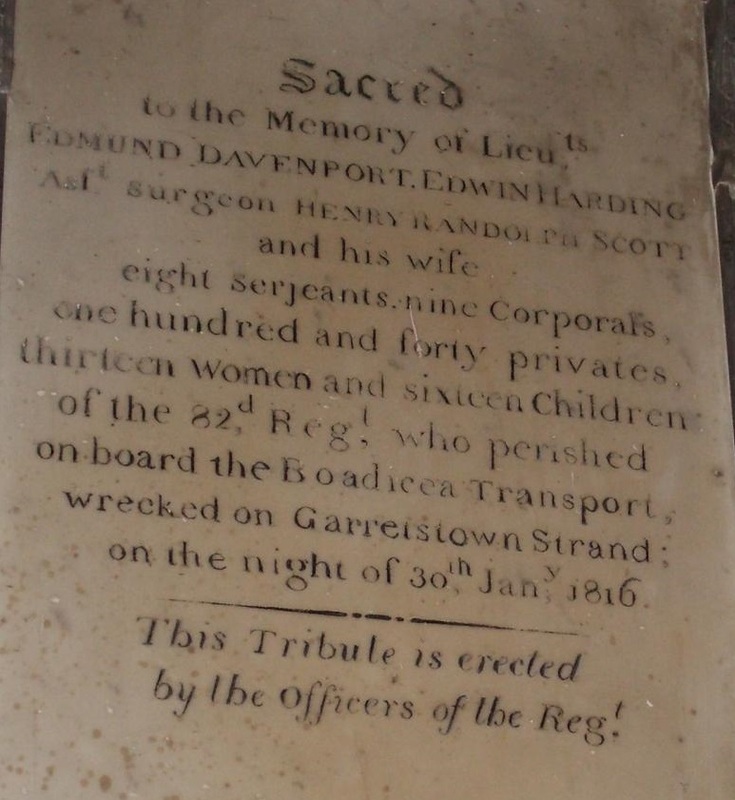 The account recorded on a plaque in memory of those lost on the Boadicea in St. Multose Church, Kinsale, gives the dead as Lieutenants Edmund Davenport and Edwin Harding, Assistant Surgeon Henry Randolph Scott and his wife, 8 Sergeants, 9 Corporals, 140 privates, 13 Women and 16 Children, adding the crew a total of roughly 200 people lost. Photo courtesy of Jerome Lordan. Most of the bodies were buried in a mound on the beach. In 1900 the remains were exhumed and reinterred in Old Court Churchyard. The church is no longer extant and visitors to the graveyard would be disappointed to see it was so overgrown with weeds. Photo courtesy of Jerome Lordan. Sacred to the memory of 145 men of the 82nd Regt., who perished in the ‘Boadicea’ transport, at Garrettstown Strand, January 30, 1816. On December 31st, 1900, they were disinterred and placed here in consecrated ground by Lieut.-Colonel Richardson and Officers of the Regt., and Robert Day, of Cork. Click on the picture for a complete list of the enlisted men drowned on the Boadicea. Waterford Mirror, 3 February 1816. Copyright of Ivan Fitzgerald . Watermark theme. Powered by Blogger.